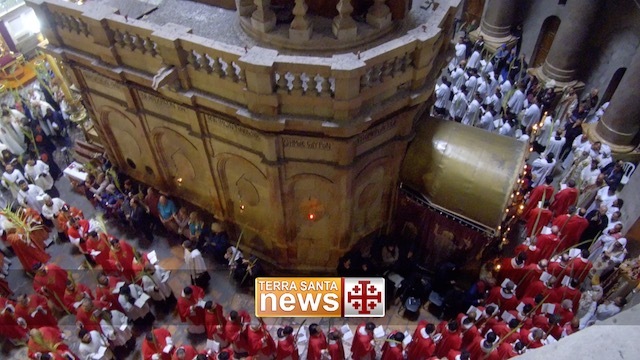 home / Multimedia / The Holy Land in news / Schools in the Holy Land: where the encounter between St. ..
“The Sultan was one of the most powerful men of the time, a formidable military strategist, and a mind open to culture and arts. Francis was simply a man who felt called by God to follow in the footsteps of Jesus Christ, to live the Gospel, and to proclaim it peacefully to every creature. The two dialogue, speak and listen.” Thus the Custos of the Holy Land, Fr. Francesco Patton, begins his account of the meeting between St. Francis of Assisi and the Sultan Al Malik Al Kamil in June 1219 in Damietta, where the crusader army and that of the sultan were facing each other. These are the words that open the “Conference on Islamic-Christian coexistence on the occasion of the Memorial of the 800th Anniversary of the Meeting between St. Francis and the Sultan Kamil” on January 30th at the premises of Terra Sancta College in Bethlehem, organized by Father Marwan , responsible for the school. 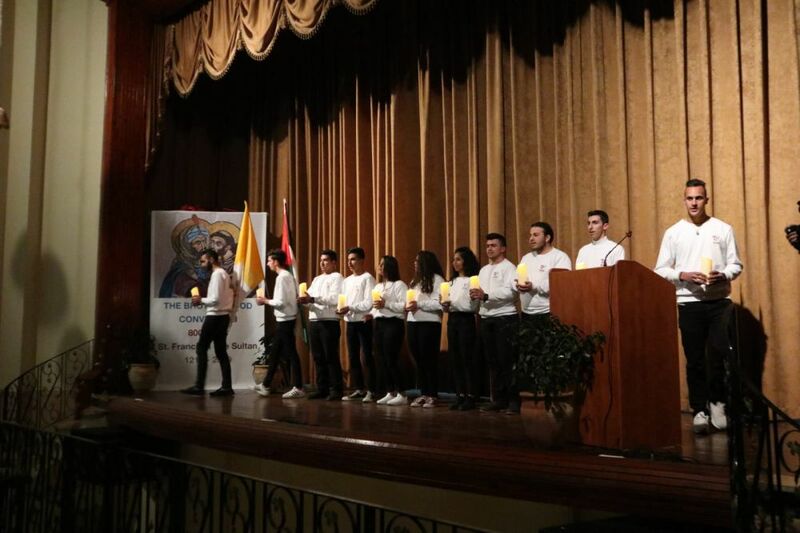 The conference was part of the broader program of the anniversary celebrations and was the result of the reflections of the students aged between 14 and 18 years of the school. Together with their teachers they carried out various activities on the theme of dialogue between Christians and Muslims. The project aims to strengthen the community’s bond and increase awareness of the importance of peace, coexistence and acceptance of the other. In fact, it is like if every day in the classes, the ancient meeting narrated in the Franciscan sources is brought back to life. The Terra Sancta College, the oldest school in Bethlehem, has more than 1180 students, of which 63% are Christians and 37% are Muslims. The program was divided into different phases: in two different days the students watched two movies “The Sultan and The Saint“, a docu-film by the director Alex Kronemer , and “Hala Lawain” (And now where do we go? ), a film by the Lebanese director Nadine Labaki, set in a small village in Lebanon where, due to the war, the relationship between Christians and Muslims is exacerbated. At the end of the screening the students were divided into groups and produced a document, a “constitution” in ten points to be adopted as a principle of life in the school and beyond. “Here we live as one, we do not look at the differences between us. Here in the Holy Land we continue this meeting” says Linda Daklallah, teacher of English and Islamic religion and part of the organizing committee, “We do not want our kids to be influenced by what happens in the rest of the world”. The conference was attended by civil and religious authorities, both Christian churches and Muslim representatives: the Custos of the Holy Land Francesco Patton and the Mufti (Islamic religious authority) of Bethlehem Sheikh Abdel Majid Ata, the Patriarch Emeritus Mons. Michel Sabbah, Bethlehem Mayor Anton Salman and Minister of Tourism and Antiquities of the Palestinian Authority Mrs. Rula Maayah. 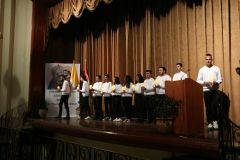 In their speeches, they thanked the students and the school staff for their commitment and for the example of great dialogue shown to the whole city of Bethlehem. “I really admire the story of this meeting” declares the Mufti Sheikh Abdel Majid Ata “In a world where everyone kills others, and in many Islamic countries there are seeds of intolerance and people nourish these bad feelings, in this school and in Bethlehem we continue to live in peace. The moment of ignition of the Christmas tree is a beautiful example and the whole world should look to our brotherhood “. We at ATS pro Terra Sancta work every day to make small signs as this more and more visible in the world.